From wily carp to massive cats, this hook link material won’t let you down and is perfect for the venue. Over the last seven years, I’ve fished with a number of different hook link materials at Beausoleil and I’ve seen anglers use a large variety of options. Unfortunately, a lot of the regular carp brand materials have failed repeatedly and it’s been a struggle to find a hook link that I could have faith in. Beausoleil has always provided anglers a unique range of challenges. What with the bridge, the island and sharp edged rocks, having robust terminal tackle is absolutely essential. Just to up the ante further, our cats love boilies so when they’re active you never know what you’re going to hook! So the ideal hook link for Beausoleil needs to be supple enough to trick our wily carp, yet strong enough to withstand the rigours of an epic battle with one of our massive cats. When fishing for carp, I’ve always been a massive fan of the suppleness of uncoated braids and Kryston’s 25lb Supernova has been my go to hook link for many years now. Sure it’s caught loads of carp but it has failed a number of times on big cats. Over the last few years I also tried ESP Sink Link, Korda Dark Matter and Nash Armour link. The ESP was too thin for my liking and I felt it put the carp’s mouth at risk during the fight, and it also let a couple of anglers down on the cats. Nash and the Korda in 35lbs are good materials, thick, and strong but they are expensive if you don’t need to have something this strong in your normal fishing. 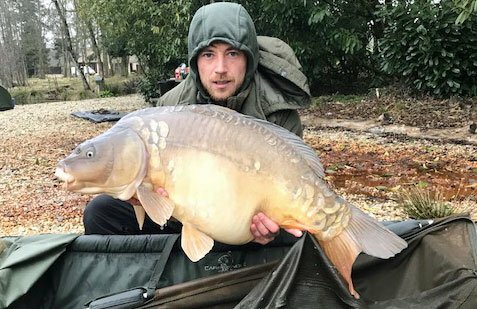 In an attempt to avoid such risks, a number of anglers have gone with our recommendation of Kyston’s Quicksilver in 45lbs for both carp and cats. To my knowledge the 45lb Kryston has never failed even our biggest specimens but I don’t like it as an all-round solution for carp as it is too stiff and prevents the rig from behaving naturally. It also has an oily smell to it which never felt right. The Kryston material is also quite expensive and difficult to get hold of . Also, most anglers don’t have much need for it at other venues so buying 25m for an annual carp fishing trip is a bit of a waste. After many years of experimentation, I am now happy to recommend a specific product from Berkley that I’ve been fishing with for over a year. It was used last year by the some anglers that purchased our Beausoleil rigs and the feedback has been excellent. It has not failed on big cats and it’s tricked plenty of carp too. 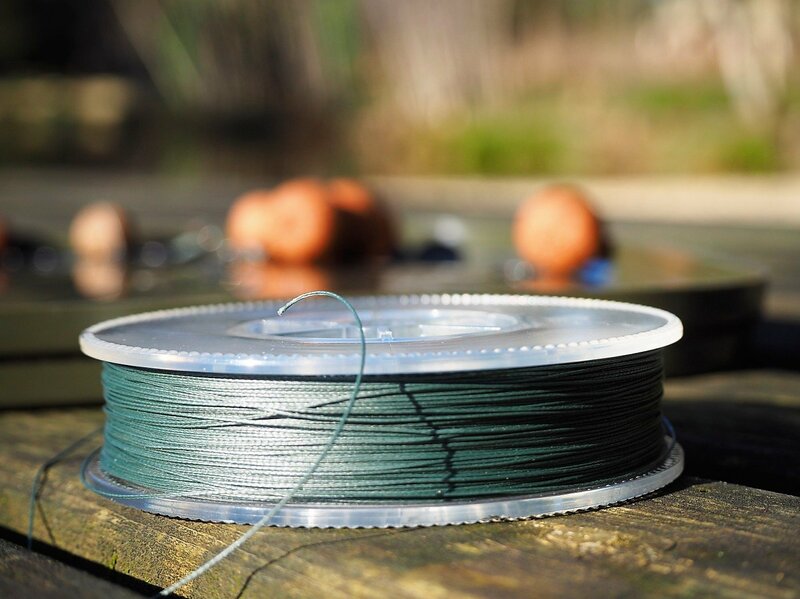 It’s only available to buy in large spools so we are offering it in 3m pre-cut lengths on our bait and accessory order form. What makes this hook link special? The material is woven from pure Dyneema (the world’s strongest fibre) so its diameter to strength ratio is off the scale. You’ll break a standard carp swivel before this will snap! It’s an eight strand micro coated braid so even if a few strands become frayed or cut during the fight, it will still hang on until you’ve tamed the beast. At 0.35 diameter, it’s the same thickness as the 35lb options from Korda and Nash so it offers excellent abrasion resistance and is much less likely to cut the delicate scissors area of any carp or catfish mouth. 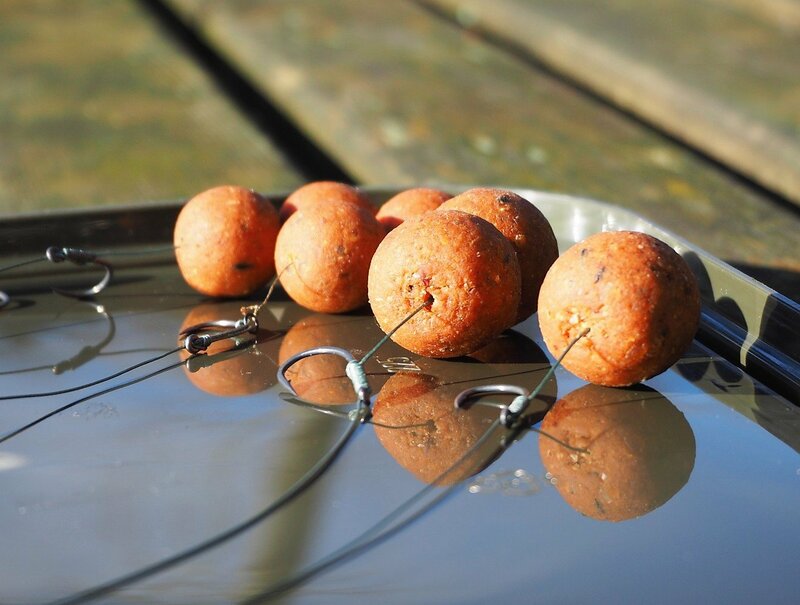 It offers similar levels of suppleness to Korda and Nash, especially when wet, so that the bait and hook move naturally and when sucked in, fall into position to catch hold in the all important bottom lip. As it’s a little thicker than traditional carp braids it is also more resistant to tangles. 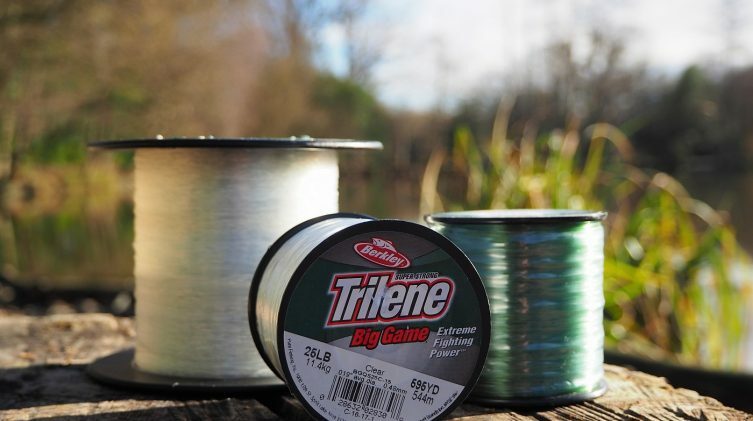 If your casting is a little rusty and landing a rig is a struggle, then this material is definitely worth considering. The lake bed here varies greatly: from pure, clean sand and gravel, through to clay, firm silt and some soft and choddy areas. 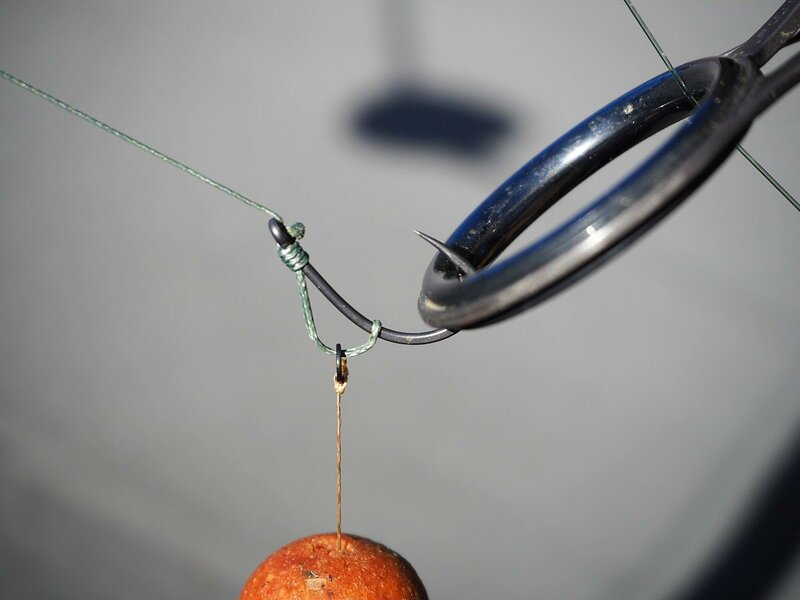 This hook link has neutral buoyancy so you can fish with it effectively on all bottom types. Over the years we have become obsessed with having everything pinned down, but does it really matter? Last year I didn’t use any putty with this hook link and it’s made absolutely no difference to how many carp I caught. For those that can’t bear the thought of fishing without a few blobs then rest assured that you can pin this material down very easily. To make it easy for anglers visiting us, we are offering this product in 3m lengths which is plenty enough for a week’s session but not too much! Available at €3 per 3m., you can order it from our standard bait form. We believe this material is the very best choice for this unique venue and look forward to hearing about all the new PB’s that it’s going to account for this year! Previous Post - A record number of 100lbs+ catfish caught in 2017 thanks to Berkley’s Big Game!